The grounds in the size of 83 x 92 meters behind the PRINCIPIA is a representation area in the style of an expanded roman VILLA; the residence of the Roman legate who was announced by the emperor, ROM´s first representative and supreme head of the legion. The Northern part of the area, located next to the VIA SECUNDA including the retracted front part and the adjacent line of rooms supposed to belong to the administrative forces. In the middle area of the front-side an indication of the main entrance could be detected, consisting of a VESTIBULUM and the adjacent PORTICUS, which leads to an open space in the centre of the arrangement. This is the place where we assume the ATRIUM and adjoining hospitality rooms could have been located. At the Eastern front side we see signs of a second entrance and continuous covered walkways (verandas) leading to a large layout of rooms at the end. Due to size and location of this area we assume that this used to be the large assembling room, the so-called OECUS. 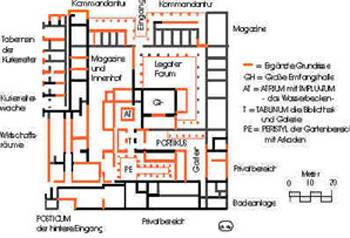 Within the extension of the middle axis, connected to the ATRIUM the TABLINUM must have been located, with lateral PARADOR and ANDRON. This used to be the borderline between the private and the official area in any roman house. The wall running from East to West with the PRORTICUS aligned in Southern direction defines the private area in the Legate's house. The reconstructions located behind the TABLINUM turned out to become highly problematic, since the original foundations of this place had been irreversibly destroyed. This is due to the additional construction of the defensive fortification of the subsequently built Roman Cavalry Citadel, after the abandonment of the legionary fortress. This must have been the former location of the PERISTYL with water-basin and PORTICUS. Foundations of TAVERNAS and of a guardhouse were discovered in the Western parts of the area. There could have been the lodgings for the courier horsemen with their horses and servants. There is no guarantee for correctness of the replenishments. 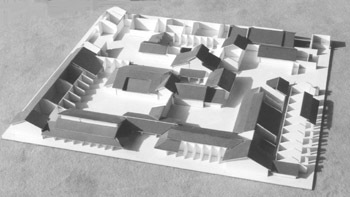 Comparison with similar grounds was done, and the missing foundations were completed to give an impression of how the entire area could have looked like.